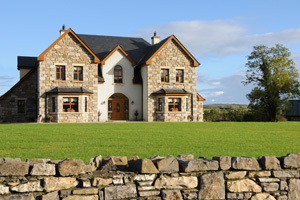 Enthusiasm and a warm welcome soon become obvious when you choose to stay at this lovely four-bedroomed house on the outskirts of Leitrim Village, at the heart of some of Ireland’s best fishing on lakes, canals and rivers. There are four ensuite guest bedrooms, three of them with twin beds and a large bedroom with three singles, which is perfect for a small angling party. Claire and PJ will sset you up for an active day with a freshly cooked breakfast and whether it’s the “full Irish”, or something a touch lighter, including free-range eggs are fresh from the farmyard! In addition, there is a private sitting room, where you can relax in the evenings to watch TV, read a book in front of the double-sided stove, play a board game with friends or just surf the net by availing of the complimentary Wi-Fi access. The mighty River Shannon is always worth a visit, especially to take advantage of the excellent mixed sport from the 40 or so fishing platforms at the Mudflats. Big roach feature strongly and can be caught on all methods, but there are lots of bream too. Famous Lough Scur is very accessible with lots of bream hybrids and tench, and is only a 10 minute drive; then there’s the massive waters of Lough Allen, dozens of comfortable spots on the canalised Shannon-Erne Waterway. Perhaps the closest venue is the famous Battlebridgestgretch of the Shannon where anglers find lots of roach on the stick float, feeder or pole. We will give you a personal complimentary guided tour of our local lakes, the River Shannon and fishable stretches of the Shannon Erne Waterway on your day of arrival. This service is backed up with detailed information sheets of the top waters within easy reach of Leitrim Village. A double garage is given over to fishing tackle space and bait fridges.